Application Insights is one of those tools that has been around for a number of years now, but is finally getting understood as more companies move to Azure as a cloud solution. It has become an amazing tool for monitoring the performance of your application, but it can also work as a general logging platform as I have posted before. Now that you are capturing all this information how can you leverage it? Going to the Azure portal whenever you want an answer is time consuming. It would be great if you could automate this process. Of course there are a number of metrics that you can create alerts for directly via the portal, but what if you want a non-standard metric or want to do something beside just send an alert? Fortunately Microsoft has a REST API in beta for Application Insights. It allows you to check standard metrics as well as run custom queries as you do in the Analytics portal. Let’s explore how to use this API. 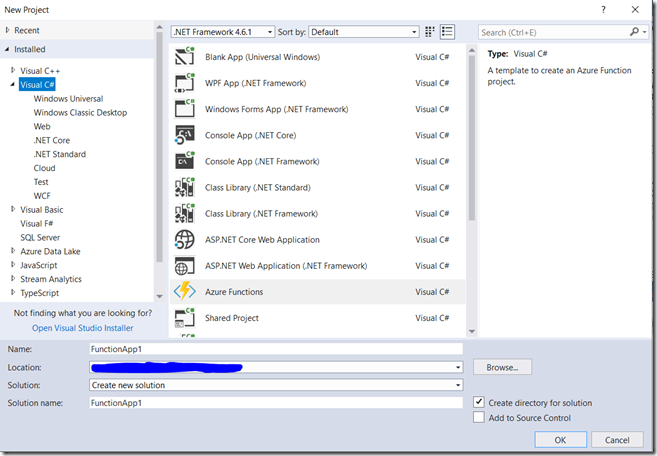 In this post will show how to create a demo that implements an Azure Function which calls the Application Insights REST API and then send the results out using SendGrid. I created them with the VS2017 Preview and the new Azure Functions templates. First we need some data to work with. The simplest way is to leverage the TrackEvent and TrackException method of the Application Insights API. In order to do this you first need to setup a TelemetryClient. The code below I have as part of the class level variables. After that it is simple to call the TrackEvent method on the TelemetryClient object to log an activity in your code (be aware it may take 5 minutes for an event to show up in Application Insights). 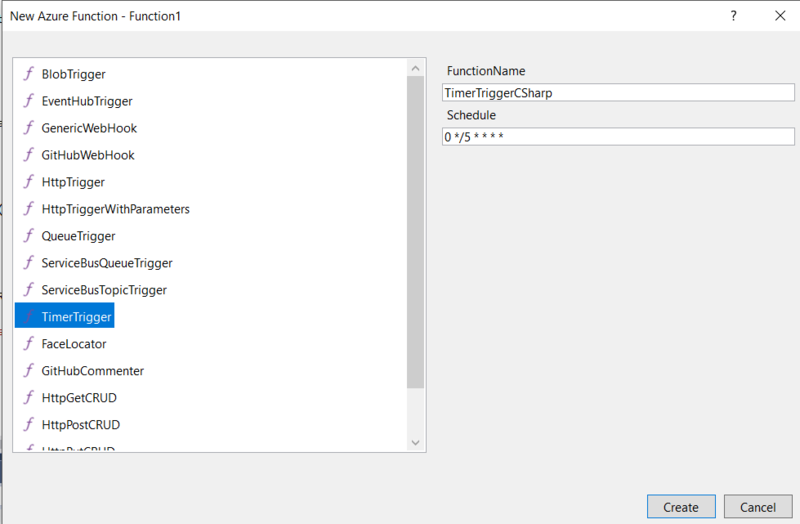 I will have another post on the details in the future, but if you have Visual Studio 2017 Preview 15.3.0 installed you will be able to create an Azure Functions project. 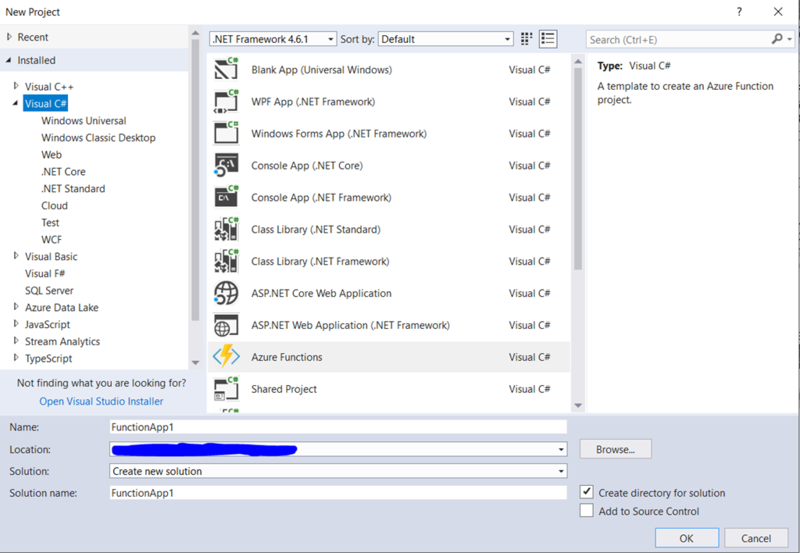 Right click the project and select the New Item context menu option and select Azure Function as shown below. 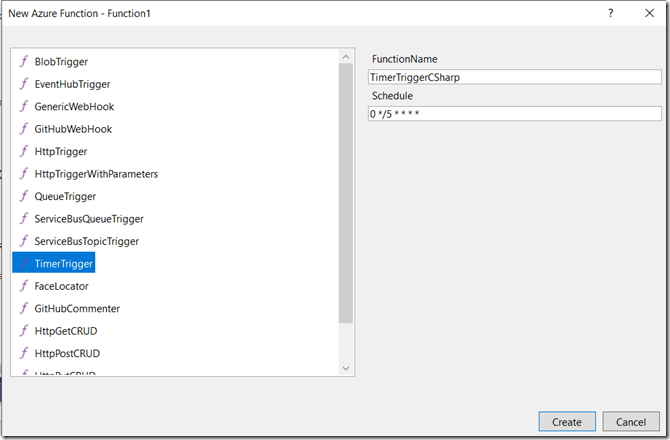 On the New Azure Function dialog select TimerTrigger and leave the remaining options as default. 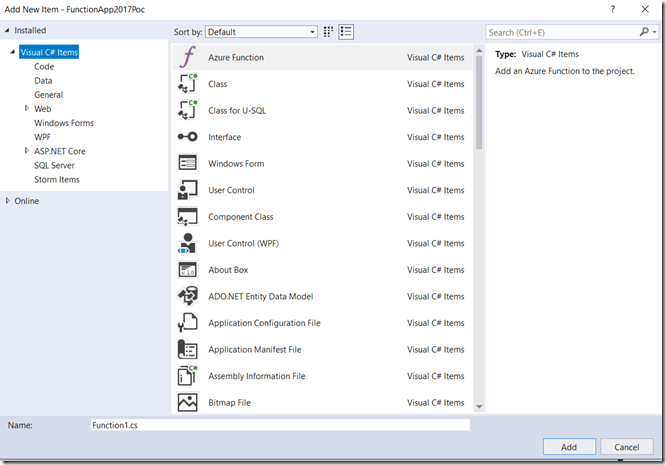 Once there are events in the customEvents collection we can write a query and execute it against the Application Insights REST API. To accomplish this the example uses a simple HttpClient call. The API page for Application Insights can be found here and contains the ULRs and formats for each call type. We will be using the Query API scenario which will be setup with a couple of variables. The call to the service is a common pattern using the HttpClient as shown below. Add this to the Run method of your new function. After we have a result we can deserialize the JSON using JSON.NET and send it to our support team via SendGrid. You will have to add the NuGet package Microsoft.Azure.WebJobs.Extensions.SendGrid. Modify the signature of your function’s Run method to match the code sample shown here. In this example “message” is defined as an output variable for the Azure Function which is defined as a binding by using the SendGrid attribute. We will also need a structure to deserialize the returned JSON message into. If you look at the message itself it can appear rather daunting but it breaks down into the following class structure. Create a new class file and replace the default class with this code. The last code example below performs the deserialization and creates the SendGrid email message. Insert this to the Run method after the HttpClient call we previously added. 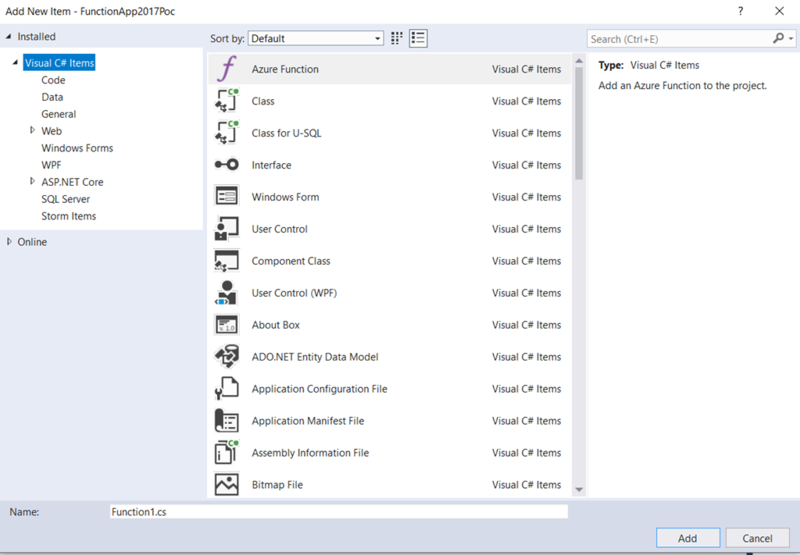 Publish your solution to an Azure Function App by downloading the Function App’s profile and using the VS2017 projects publish options. You will also need to define the application settings referred to in the code so that they are appropriate for you environment. At that point you will be able to observe the results of you efforts. This post demonstrates how a small amount of code can give you the ability to leverage Application Insights for more than just out of the box statistics alerts. This approach is flexible enough to be use for report on types of errors and monitoring if subsystems are remaining available. Combining the features within Azure’s cloud offerings gives you capabilities that would cost much more in development time and resource if they were done on premises. My only real problem with this approach is that I would prefer to be accessing values in the result by name rather than indexes because this makes the code less readable and more brittle to changes. Try these examples out and see what other scenarios they apply to in your business.